I may have been a little too relaxed about this. With a week to go, I still need to write nearly 30,000 words. 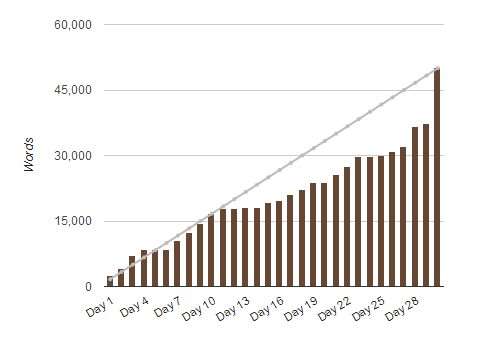 Having ‘won’ Nanowrimo three times out of four attempts, I was pretty sure I would be able to pull it off again. But I have never had to do it alongside a full time job. Last year, in part for that very reason, I didn’t compete*. Getting home from work after a day’s concentration does not really leave me in the mood for more concentrating. 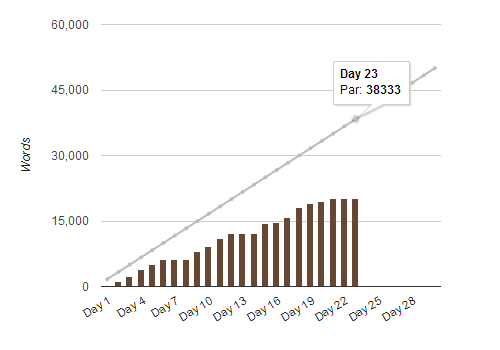 I am roughly 18,000 words below par today. Unlike previous years, I have never actually been above par. I started the month by going to a colleague’s leaving drinks instead of writing, and started the next day with a soul-crushing, will-sapping hangover. The writing has continued in similar style ever since. But take heart, for I am not beaten so easily! ** See that crazy jump at the end of last year’s graph? That’s a 14,000 word jump. I’ve done that on the 30th November twice now, and I fully intend to do it again this year, if I have to. That means I have to catch up a mere 4,000 words by the 29th. Helping me on my way is a day’s holiday and the end of a freelance contract, which combined should give me four days of uninterrupted writing at the end of the month. The results of this headlong dash are unlikely to be pretty, but the thing that really cripples the draft of a novel is not that it is rubbish – that’s what editing is for – but that it is non-existent. By the end of the month I should be holding an ugly, messy, half-baked heap of pages, also known as the second draft of my novel. *I also think four unfinished novels is enough for the time being – I probably ought to get round to finishing one. **Gentlemen, to bed! For we rise at daybreak! Etc.